Thirsty? It seems hard to find public water fountains these days. Even worse, survey data reveals that 43% of school-age youth report that there are few or no working fountains in their K-12 school buildings. I share the concern voiced recently by Washington Post contributor Kendra Pierre-Louis that the “disappearance of water fountains” is hurting public health. First, both access to and attitudes about drinking water can shape a person’s risk of tooth decay. As Pierre-Louis explains, a researcher with the Centers for Disease Control and Prevention (CDC) has found that the less young people trust the water from drinking fountains, the more sugary beverages they consume. Sodas and other sugar-laden drinks give the dental disease process — known as “caries” — the fuel to progress into cavities. Research also has confirmed links between frequent consumption of sugar-sweetened beverages and obesity and Type 2 diabetes. Second, when people drink bottled water, they are often not getting the recommended level of fluoride. Fluoride is a mineral that exists naturally in water but usually at a concentration that is too low to help prevent tooth decay. This is why more than 18,000 public water systems in the U.S. add more fluoride to reach the recommended level. According to the CDC, fluoridated water reduces tooth decay by 25% over a person’s lifetime. Pierre-Louis points out that health isn’t the only thing that can suffer when tap water isn’t readily accessible. She notes that bottled water has a big carbon footprint, requiring 1.5 million barrels of oil to create the 50 billion plastic water bottles Americans use each year. What’s more, bottled water is dramatically more expensive than tap. Fortunately, there is good news. Many communities are taking steps to improve public access to tap water. “TapIt” campaigns enlist partners (local restaurants and cafes) who agree to provide free refills of tap water to pedestrians and bicyclists on request. The metro area of Washington D.C., where I live, has an active TapIt campaign with dozens of partners. In New York City, TapIt has created a Google map showing the nearest location for getting a water refill. 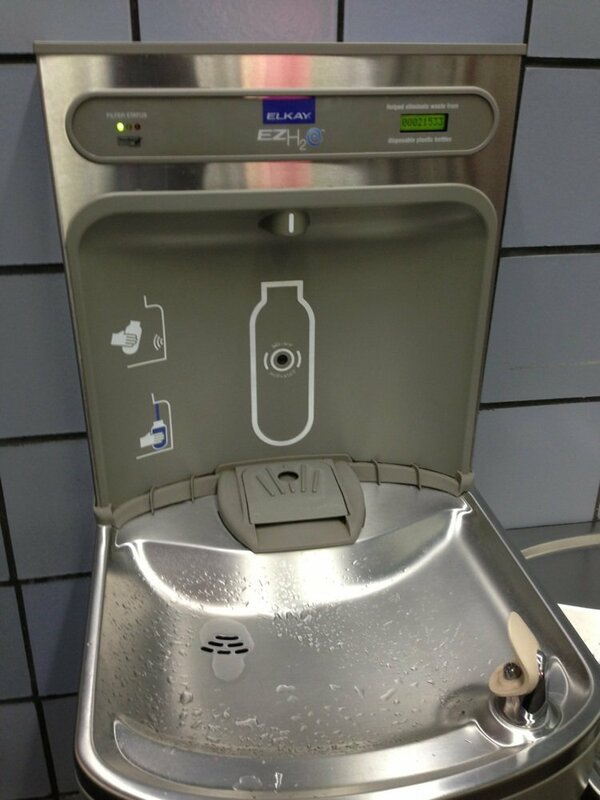 During a recent trip to Chicago, I was pleased to see a water refill station similar to the one pictured above near my gate at O’Hare airport. Airports are not known as places where healthy food choices abound, so this is encouraging. The airlines may charge us for the bags we check, but at least the water is free.